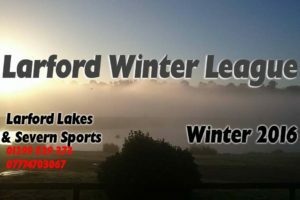 56 anglers in 14 teams fished the 4rd round of the Larford Winter League on the Match & Specimen Lakes. Winner overall today was Richard Clement who drew peg 36 on the Match Lake. Richard fished for Salad Doggers, caught on 14m pole & pellet to weigh 66-01-00 of carp & bream. 2nd on the day was Paul Law (Salad Doggers) who drew peg 78 on the Specimen Lake. Paul fished method long to weigh 56-15-00 of carp & bream. 3rd overall was Carl Jones who drew peg 52 on the Match Lake. Carl fished for HT angling weighing 56-10-00 to pole & soft pellet. 4th on the day was Paul Cook (Frenzee) who drew peg 58 on the Specimen Lake. Paul caught on the Method & long pole weighing 43-10-00. 5th placed Max G (PR Floats) drew peg 24 on the Specimen Lake and fished the method at distance to weigh carp & bream for 40-15-00. 6th placed Chris Cameron (Middy) drew peg 42 on the Match Lake weighing 37-03-00 to the Method and Pole & Pellet.